Zanon looks back after the ball bounces off the post. 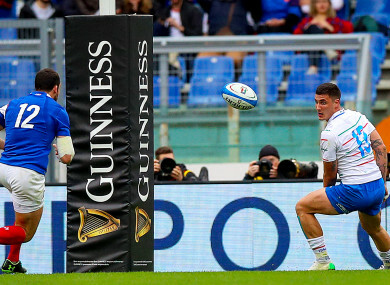 FRANCE MANAGED TO survive a late siege from Italy to end their Six Nations campaign with a second win. The victory was far less comfortable than an 11-point margin would suggest and arrived after three excellent individual moments from Damian Penaud. The wing, consistently good through France’s stuttering campaign, scored the try to finally kill off Conor O’Shea’s hopes of a win, but also denied Marco Zanon by clinically targetting the ball as the centre dived over the try-line with the visitors leading by six with six minutes remaining. After a solid start from the hosts in Rome, Tommy Allan kicked the Azzurri to a 6-0 lead before France found the gap they were waiting for after 16 minutes. Maxime Medard made a cut and got his offload away to set Penaud haring down the right wing and he then found the supporting run of Antoine Dupont to complete a terrific try. Romain Ntamack delivered another composed day and followed up his conversion with a penalty to extend the lead, but Italy came agonisingly close to hitting back emphatically. Unfortunately, Allan’s clever kick through the line bounced off the post padding with Zanon ready to pounce. Allan reduced the 6-10 half-time deficit to a one-point game with a 42nd-minute penalty, but Les Bleus again showed the attacking flair which at times comes so easily. After break from Ntamack, a searching pass across the 22 stretched Italy and allowed Yoann Huget step into the corner. If the tide felt like it was going against Italy then, the current was even stronger minutes later when Allan hooked wide with an attempt to whittle down the deficit. But the hosts were not ready to let go of their Alpine neighbour’s coat-tails and an audacious dummy from Tito Tebaldi brought a try 54th minute try. Another missed conversion followed, but with a three-point game in store France were not going to be allowed ease off the pedal by this modern Italian outfit with vastly improved endurance. Ntamack knocked over a drop-goal to increase the breathing space and that wiggle room proved essential in the endgame as Italy mounted an onslaught of forward pressure. Camille Chat was sent to the bin after a string of Fench penalties and after a brilliant line-out take from Sergio Parisse, Italy bravely sought width and created an overlap that looked to bring Zanon a certain try, but a brilliant intervention from Penaud popped the ball out of the centre’s grasp. France escaped, and showed no sign of all the pressure they had been under when Ntamack let a back-handed off-load loose to Penaud and the wing stormed away to seal the win. Email “Penaud punishes Italy as France survive late onslaught”. Feedback on “Penaud punishes Italy as France survive late onslaught”.